I apologize for the radio silence for the past 10 days but the past 3 weeks have been really difficult for me. Most of it are personal reasons I don’t want to get into on this blog, mostly because I think I’m still processing everything myself. I’m finally starting to get decent sleep and slowly getting my desire to bake/cook back. On top of everything, my brother was here this past weekend so I wanted to soak up as much time as possible with him. A week ago today we had to put my horse down, Ashley, who has been “my” horse for the past 12.5 years. I started taking care of her when I had just turned 12. I would go up to the stables and groom her, graze her, and just spend time with her. The day my trainer told me I was going to ride her in camp July 2002, I literally shouted for joy and then had to remember I was around horses and couldn’t shout. Ever since then, I’ve ridden and taken care of her. We’ve made it through quite a few show seasons, some of them taking home the Grand Champion ribbon for the season. We made it from itty bitty crossrail jumps to 2’9″ fences. I took my share of tumbles, fracturing my ankle one lesson and bruising my face/unable to remember the rest of the lesson another time. But she was my horse and we were a team. The past couple of months she dropped a lot of weight, was laying down a lot, not really eating, and we knew it was a matter of time. That didn’t make it easier and the loss has hit me really hard. I could honestly write an entire blog about her and our shenanigans, but I don’t think you came here to listen to me talk about my horse, so let me talk about this granola. I’ve never made granola before, but it’s something I love to eat for breakfast, whether it’s with almond milk or on top of yogurt. I knew for my first batch I wanted to do something that was in a similar vein to the quinoa granola “bars” I made almost two years ago. And honestly? I’ll make it again. and again. The chocolate chips added enough sweetness while the quinoa provided a great crunchy nutty flavor. The coconut oil added a subtle layer of coconut without actually tasting like coconut. All the seeds and oats added texture and healthy things. (god, could that be more vague? ‘healthy things’) Definitely a good granola, and definitely a great one for a first time. 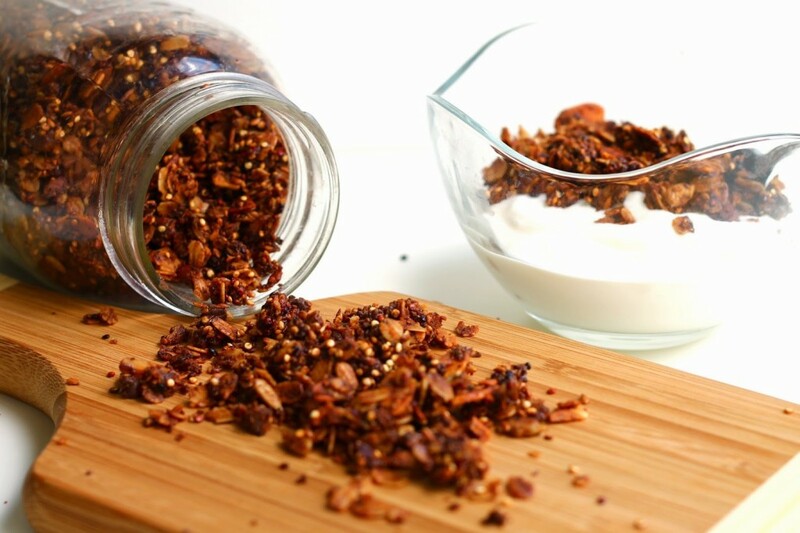 I ate this granola every morning and just ran out, so I think it’s time to make a new batch! Preheat oven to 325 degrees F. Line baking sheet with foil and set aside. In a large mixing bowl, stir together oats, quinoa, sunflower and flax seeds, ground flax, almonds, and salt. Set aside. In a small sauce pan, brown butter. Once butter has melted, whisk continuously until brown flecks begin to form on the bottom. Remove from heat, whisk for 20 seconds more, and transfer to a separate bowl. Stir in honey, coconut oil, and vanilla. Pour wet ingredients over the oat mixture, until evenly coated. Spread uncooked granola evenly over the baking sheet. Bake for 10 minutes. Remove pan, stir granola. Bake 10 minutes more. Mix granola again. Bake for 10 minutes more, checking every few minutes until granola is golden brown. 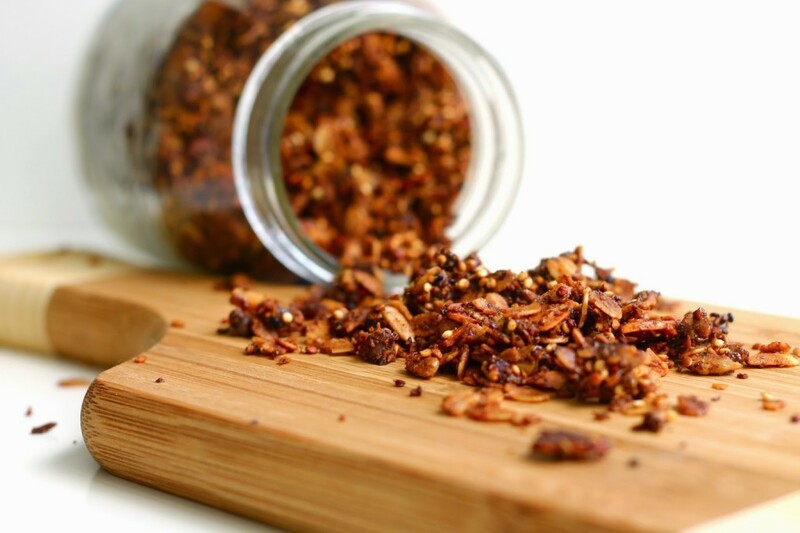 Remove granola from oven. Let sit for 15 minutes. 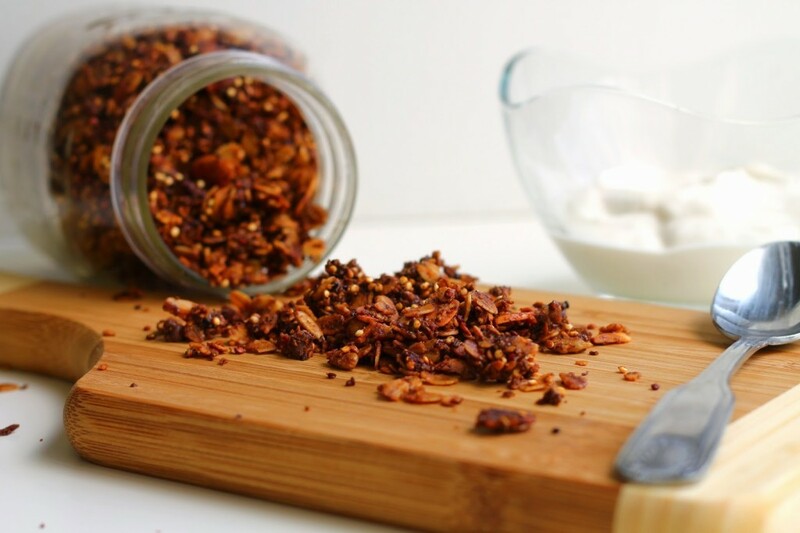 Gently clump together granola and stir in chocolate chips. It’s okay if the chips melt. 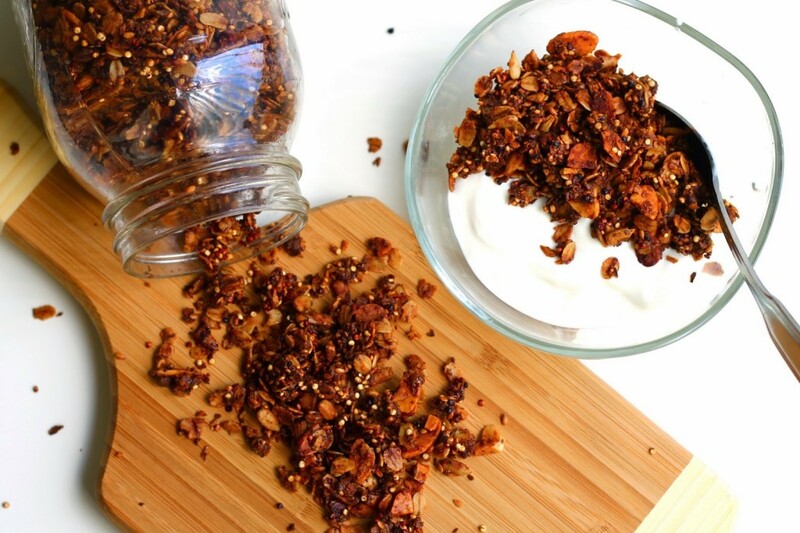 Let granola cool completely and store.